Six parts is how you do an event it seems, as Trinity War concluded with this issue! But, to call this an ending to the story just isn’t true. 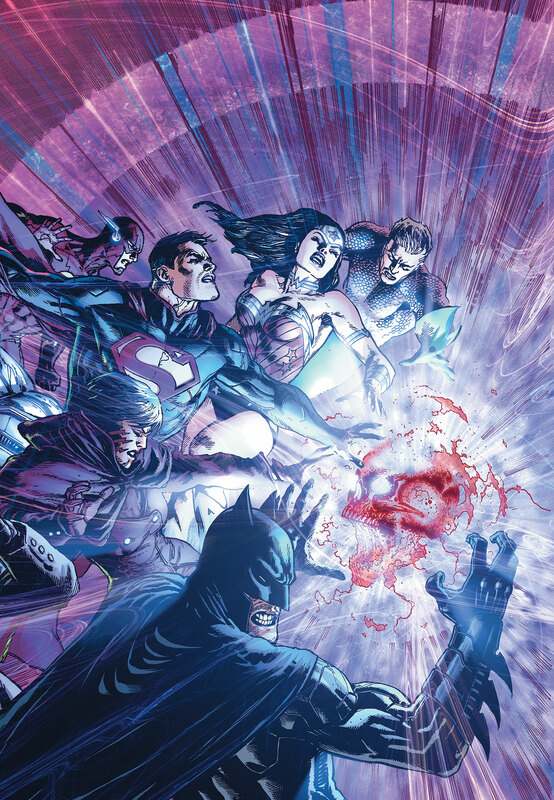 Justice League #23, builds up throughout the issue to a climactic result that leads directly into DC Comics‘ event Forever Evil, which launches this week. And this issue, and event, does something impressive. Even though it flows directly into a bigger event, it’s also a standalone story that does well in answering the questions raised throughout, including what exactly is Pandora’s Box. I’ll admit, I’m generally event fatigued, but DC has done an excellent job here making this feel more like a multi-part story arc as opposed to an event jumping from series to series. Made up of only three comics, with a few tie-ins that aren’t important, Trinity War to me was a success, though didn’t completely blow me away. As a whole I’d sum up each part of Trinity War as a fight that gets out of hand due to some misunderstanding, folks come to their senses for a little bit, then run off on some next clue to fight again. Wash, repeat. But, that’s what I found most interesting about this issue. It breaks the narrative from the previous five parts. Instead of watching heroes fight (it does happen a bit) we get the story from the perspective of the Outsider, a villain whose identity is revealed in this issue. And the bigger plan is also revealed as well. The Secret Society is what we’ve been focused on for quite some time, thinking they were the main bad guys, but in fact it’s all been a well orchestrated plan to bring forth much worse villains. Sadly all of that was spoiled leading up to the issue, but I did well to avoid that online, and don’t want to do that for you here. I also like DC’s use of some hints and imagery throughout the series. We assumed the trinity was one thing, when in fact it is also something else. Going back and re-reading some of those hints, there’s a lot of word play that I have to give credit where credit is due. All together it’s a lot of fun. In the end, the issue is a fun one. The artwork is solid and it’s a nice wrap-up and lead in to what’s happening next. Trinity War as a whole was a fun for me, bringing together the bulk of the major DC heroes and letting their personalities run wild. There was a enough twists that it kept me on my toes and wasn’t what I was expecting. Overall I had fun reading this and that’s what comics are about.